A reader writes: I supervise a summertime internship program at my job, which attracts mainly college-age applicants. A huge component of the internship is attention to detail. This week I received five applications for the internship. Three of those have included detail errors, some minor and some major. We’re counting down the 10 Useful Things You Didn’t Know You Could Do With Your iRecruit Account. 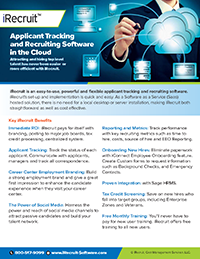 About iRecruit iRecruit is a cloud-based recruiting and applicant tracking and electronic onboarding software designed to provide any size of business a cost effective, affordable and truly simple way to manage the recruiting and onboarding process online. WOTC Questions: Are there locations in the US that employers would not qualify to receive the “incarcerated” credit? Many recruiting leaders are not aware that “the magic bullet” in recruiting is improving your speed of hire. Hiring faster improves your quality of hire because you make a hiring decision before any top candidates drop out to take a competing offer. Many legacy companies would like to transform themselves into agile, talent-first organizations. But when some CEOs in this position look at the people they employ, they discover a problem: a swath of their existing team doesn’t have the necessary skills or metabolism for change to meet the new challenges. Your company is who staffs it. If you’re at the helm of that decision-making process, yours is no small task. You need a candidate who gets it-someone who is quick to engage, motivate and onboard. But interviewing can be elusive, exhausting and difficult to streamline. Writing a great job description is hard enough, but there’s always the lingering question of how a business should advertise a position’s salary. There are different schools of thought on this topic, and what the company is looking for in a candidate may sway how it handles the situation. This entry was posted in Blog, iRecruit Blog and tagged #FridayReads, Recruiting News Round Up. Bookmark the permalink.